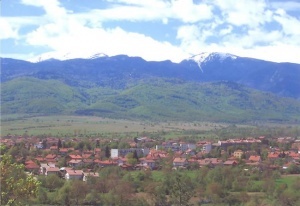 The town of Samokov has a population of 27 664 inhabitants and is 950 m above sea level. It is situated in the northern foot of Rila Mountain in the field of the same name, which is the highest in Bulgaria. The longest Bulgarian River Iskar, springing from Rila, flows through it. It is situated 60 km south-east of Sofia, 40 km east of Doupnitsa, 36 km south-west of Ihtiman, 37 km west of Kostenets and 12 km north-west of Borovets Resort. There are 6 more resorts in the region, 2 of them being of international significance. Samokov is the biggest potato producing town in Bulgaria. The past of the town is related to iron mining. Once there was a Roman settlement and the present town originated much later - at the beginning of 14th century as an ore mining settlement. At that time, Bulgarian craftsmen had direct contacts with the West-European miners - Saxons, called Sassi, and after their model Saxon furnaces (vidni) were introduced, as well as forgery workshops (madani) with blowers and big hammers (samokovi- from where originates the name of the town) set in motion by water power. When the Turks conquered the town (1372), Samokov was an economic and cultural centre. Initially, it became municipal and later regional centre, administering today’s Blagoevgrad, Doupnitsa, Razlog, Ihtiman and many other settlements. The first Bulgarian printing house of Nikola Karastoyanov was opened here (1827). It is not occasional that in the end of 18th and the beginning of 19th century the most numerous and renowned art (icon-painting, landscape and wood-carving) school of art in our country was founded here - the Samokov School of Art. Some of the most famous Bulgarian painters were born or worked in Samokov, such as Hristo Dimitrov and his sons Dimitar and Zahari Zograf, Stanislav Dospevski, the son of Dimitar Zograf, Ivan and Nikola Obrazo-pi-so-vi and others. Konstantin Fotinov, the foun-der of the first Bulgarian magazine, Lyuboslovie (1844) is also from Samokov. Here was initiated the struggle for independent Bulgarian church, and 50 citizens of Samokov fought as volunteers in the Russian-Turkish War for Liberation. The decline of crafts at the end of the century ruined the town and it lost its economic, cultural and administrative power. The town is rich of cultural and historical monuments. The Town Museum of History keeps otems and documents, related to the most specific for the region and the town industrial branch - iron mining, which existed until 1908. The collection of typical for Samokov embroidery of folk patterns and types of textiles is interesting. The Assumption of the Holy Virgin Church is one of the most remarkable architectural and artistic monuments in our country. Built in 1790-1791, it is the collective labour of the talented masters of Samokov - builders, wood-carvers and painters. The most remarkable thing in it is the iconostasis created in 1793 and 1821 - a bright example of the woodcarving school of Sa-mo-kov. The church of Belyo – The Birth of the Holy Virgin Church is a monument of culture from 15-16th century with rich mural decorations. The big rinking-fountain (the drinking-fountain with the ear ring) dates before 1662. The Convent (the Metoh – maidens’ monastery) was created in 1772. St. Nikola Church, Belyo’s House, Saraf’s House, Otez Paisii Cultural Centre and memorial, a monument to the perished in the wars 1912-1918. Many are also the monuments dedicated to the Russians who were killed in 1877-1878, to the first printer Nikola Karastoyanov, to Konstantin Fotinov, to Chakur Voivoda (people’s defender against the Turks) and others. As a resort, Samokov is attractive with its favourable climatic conditions, the beautiful coniferous forests around, the River Iskar and mostly with its closeness to Borovets and Malyovitsa. Hotel Iskar, the Covent (Metoh) - a romantic, serene and cheap place. There are several family hotels and private lodgings. 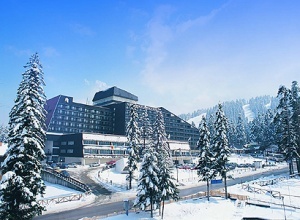 The resorts in the vicinity offer greater choice for accommodation than Samokov itself. There is a large fruit and vegetable market in the town and many catering facilities offering tasty Bulgarian cuisine. In this respect, the old Saraf’s House is recommendable. Samokov is connected with the only by bus transport. Between the town and the capital city Sofia there are state bus lines at every hour as well as private minibuses. Every 30 min there are buses to Borovets departing from the bus station. There are no direct bus lines to Malyovitsa, but one has to travel to the village of Govedartsi, from where local transport is called by phone at the Training Centre or at the Hotel. Travelling by private minibus from the town is also possible, but the cost is higher. The town is connected by regular buses with Doupnitsa, Sapareva Banya, Belchin Banya, Dolna Banya, Kostenets and other towns and resorts as well as with all villages in the region. The bus station is in the centre of the town. There are bus lines within the town. The town is the gate to the highest mountain in Bulgaria and the Balkans - Rila. Mostly through the famous resorts Borovets and Malyovitsa (refer to the Rila related chapter herein) any point of the mountain can be reached along marked tourist tracks. At a distance of 13 km to the south-west, near the road to Malyovitsa the big resort village of Govedartsi is located, also an outgoing point for hikling tours round the highest mountain (refer to the Rila relatec chapter herein). At 3 km distance to the South of the village there are many recreation homes, profilactoria, administrative and private villas, as well as a tourist facility of the tourist institution – Sotsialen Otdih with 100 beds (in bungalows). Among these is Mechit Chalet with one of the best ski-runs in our country, served by a ski-draw. There are several family hotels in the village, as well and many interesting catering facilities, some offering typical Bulgarian cuisine. There is an Ethnographic Museum. The famous Bulgarian writer and mountaineer Assen Hristoforov spent the greatest part of his life in Govedartsi. There is a bus connection with Samokov several times a day. The Belchinski Bani Spa is siutated at a distance of 13 km to the west of Samokov by the River Palakaria. The temperature of the mineral water is 41.5o C and is curative mainly for diseases of the joints, bones and the locomotion system. There are recreation houises, and open-air pool. At a distance of 10 km from the village of Alino is situated the famous Alino Monastery from 16th century. 30 km to the east of Samokov is situated the resort town of Dolna Banya with mineral water temperature - 56.3oC. The recreation campus is 5 km to the south, with many recreation facilities and children camps. There is a tourist challet, called Gerginitsa (80 beds). Marked hiking tracks start from the recreation campus across Eastern Rila (refer to the Rila related chapter herein).